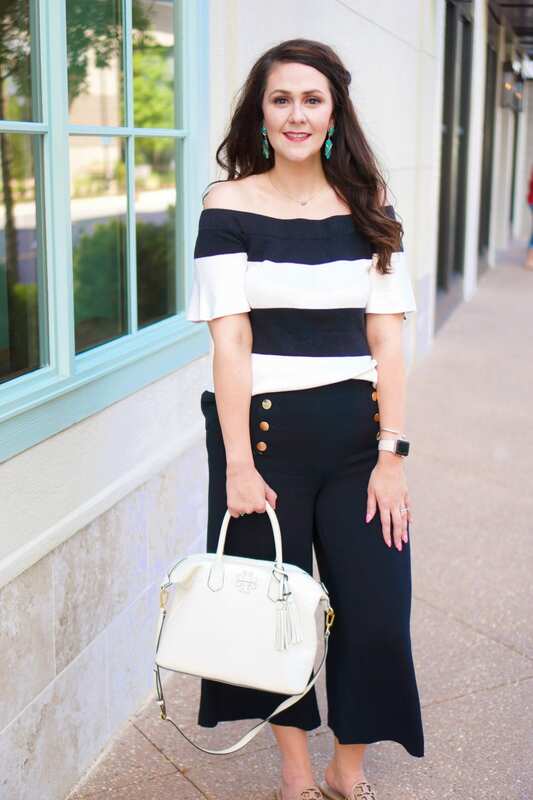 Each month, I team up with some of my blogging buddies for the How I Style It series-we all take one style idea and each put together an outfit based on it. 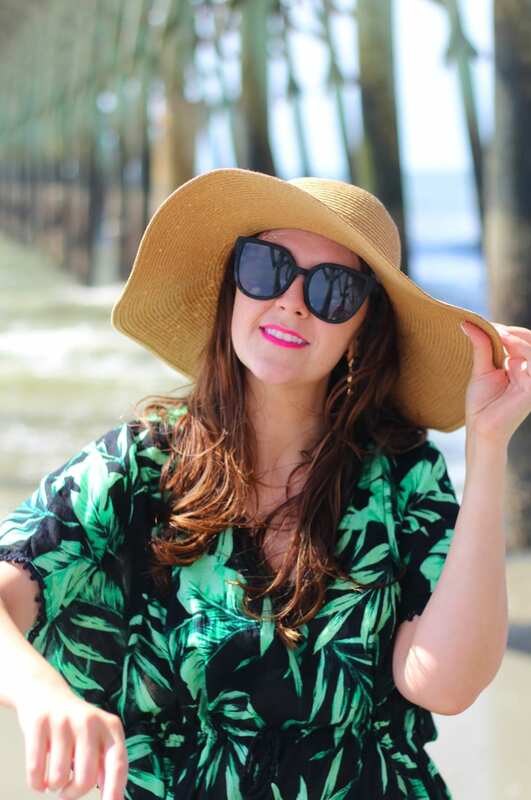 This month, the How I Style It crew has teamed up to show you how we’re styling the tropical trend, like my tropical palm print swim look! Check out Becky, Della, and Nicole’s looks for some more outfit inspiration! Let’s get REAL here for just a moment–I debated about posting the palm print bikini pics, but I did post them. Why? Because beauty comes in all shapes and sizes:) And this bikini made me feel GOOD about myself. I was really sad when Victoria’s Secret announced they would stop selling swimsuits this year (you can still get the PINK brand swimsuits), but Old Navy has stepped up their swimsuit game and I bought three different bikinis from them this summer! I felt supported by the top, which is a medium. And these are the BEST fitting swimsuit bottoms I’ve ever had! I usually wear a medium or large in other types of bottoms, but I sized up to an XL in these and they fit my big hips perfectly! This palm print is so on trend right now too. To match, I picked up this palm print coverup. Now, while I don’t have to be matchy-matchy when it comes to prints, etc., I picked up this palm print coverup because of the fit and the material. It’s an oversized fit, so be sure to size down one size (I did not). WORD OF CAUTION: I originally found this coverup in a size medium, which I’m wearing, but I wanted a better fit and the store didn’t have a small. So I went to the other Old Navy in town, and tried on a small, but something didn’t fit right. Turns out the small was 3-4 inches shorter! I investigated, and the material between the two seemed to be slightly different, even though it’s the same product. So if you’re tall and looking for a longer length, see if you can find one of these that has the slight white tint to the inside of the fabric! To accessorize, I added some fun drusy earrings that picked up the green from the palm print. My Tory Burch Miller sandals made for the perfect shoe (I want the neon pink ones so bad!). 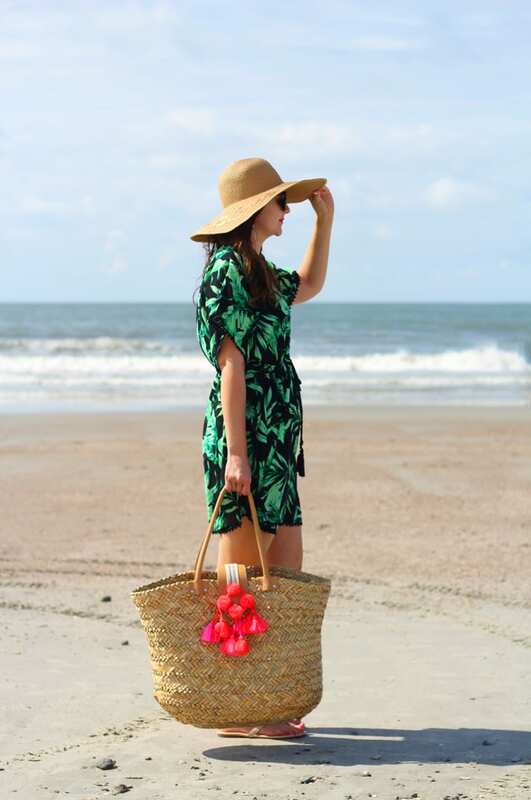 And if you’re in the market for a new beach tote, you need to get this one! It fits so much inside. Finally, what beach look is complete without a straw beach hat? Be sure to check out the rest of the How I Style It crew to see how they’re styling the tropical trend! I love how old navy has matching everything with their prints! And yay, you are on the beach! Right?! It’s a matchy-matchy dream! That coverup is so cute! I’m still heartbroken that VS has stopped carrying swimsuits. Same here, but I’m really pleased w/ Old Navy’s selection this year! Thanks! You look terrific in this bikini – work it gurl! Thank you!!! Isn’t it silly that I was afraid to post this pic? Well you know I love this cover up! And you look so great in that bikini! Thanks! And it’s such a great cover-up! You are rockin the bikini! I was super sad about VS swimwear since almost all my bikinis are from there. I love the matching coverup too! Soooo cute! Be sure to checkout Old Navy1 I was super pleased! What a fun matching set! Loving the palm print and these photos are so pretty! Thanks, Heidi!!! I’m all about the palm print this summer! What a fun look! I love the palm cover up and look at you rockin’ a 2 piece! You look amazing! Thanks, friend!!! I always prefer two pieces. Love everything about this! You look amazing! Hope you all can enjoy some sunshine now! Thanks, Keri! We had a great time! Super, super cute! Last year was the first year I really got a swim coverup for Mexico and I love em now! Same–I got one like 4 years ago and have loved them ever since! Girl you are rocking it!! Wear that bikini with pride!! The cover up is super cute as well! Such a cute cover up. I really wasn’t into tropical prints until I bought a pair of shorts two years ago. Now I want everything palm print when summer comes. You look lovely, dear. I am cuckoo for a palm print, and this one is fabulous – what a gorgeous colour on you. And then you took it off to reveal that matching bikini!! Amazing. Great shots with the boardwalk thing in the background too, gives lovely depth to the pics. Thanks!!! I’ve become obsessed with palm prints! Looking beach ready, you bikini babe, you! 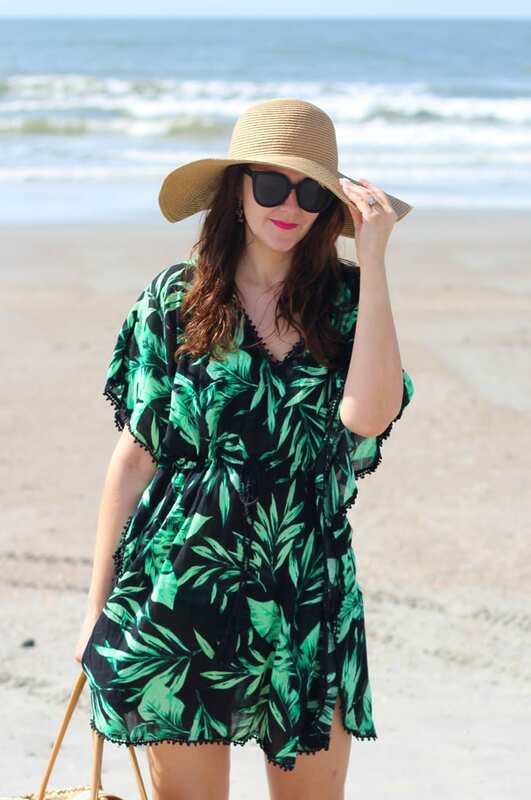 Love this palm print cover up and bathing suit! Thanks for sharing at the Moda Thursday linkup. Thank you, Christine!!! I had to get them matchy-matchy! Fabulous beach babe look! Thanks for linking up with Fun Fashion Friday! This is such a cute coverup and bathing suit!! Loving the palm prints for summer. Thanks so much!!! Same here. Amen, girl! All shapes and sizes! But you look FABULOUS! Love the floral print too! Thank you!!!! And right back atcha! Thanks so much, Grace!!! You too! I love the matching two-piece bikini with the coverup! You look fantastic!! That bikini is so flattering and you are rocking it!! The coverup is adorable too! What a great coverup! I love the tropical looks out, and your swimsuit is adorble ! Love the pictures at the beach.